U.S. 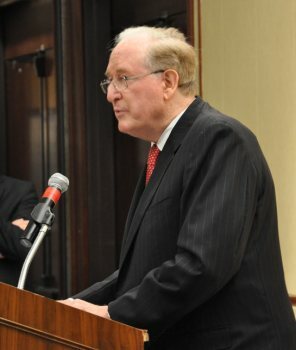 Senator Jay Rockefeller is calling for a National Academy of Sciences study on the effect of violent media on children. In the wake of last week's devastating attack on Sandy Hook Elementary School in Newtown, Connecticut, West Virginia Senator Jay Rockefeller has introduced a bill calling for new research into the impact of violent videogames and other media on children. "At times like this, we need to take a comprehensive look at all the ways we can keep our kids safe. I have long expressed concern about the impact of the violent content our kids see and interact with every day," Rockefeller said in a statement. "As Chairman of the Senate Commerce Committee, I have introduced legislation to direct the National Academy of Sciences to investigate the impact of violent videogames and other content on children's well-being." Rockefeller's bill would see the National Academy of Sciences conduct a comprehensive study into the harmful effects of violent games and videos on children, specifically whether they "cause kids to act aggressively or otherwise hurt their wellbeing, and whether that effect is distinguishable from other types of media." The NAS would have 18 months to complete its investigation and submit its report to Congress, the FTC and the FCC. "Recent court decisions demonstrate that some people still do not get it. They believe that violent videogames are no more dangerous to young minds than classic literature or Saturday morning cartoons," Rockefeller said, presumably reference the United States Supreme Court decision confirming that videogames deserves the same First Amendment protections as other media. "Parents, pediatricians, and psychologists know better. These court decisions show we need to do more and explore ways Congress can lay additional groundwork on this issue." In a "Minute With Jay" video posted today on YouTube, the senator also called for a ban on "military-grade assault weapons" and a renewed "national dialog on improving mental health services."